There's no question that antlers are hot these days, with collectors paying top dollar for quality racks and everyone from hunters to hikers searching for them in fields and backwoods across the country. Handicraft techniques have moved far beyond the basic trophy mount as well, and one can find antler knives, antler pipes, and even antler chandeliers in shops and homes. Dennis Walrod's Antlers offers an entertaining and informative survey of all things antler, from their biology to their role in Native American culture to the sordid side of the antler boom. (Dubbed "the new ivory" by some, they have a lively presence on the Asian aphrodisiac market.) 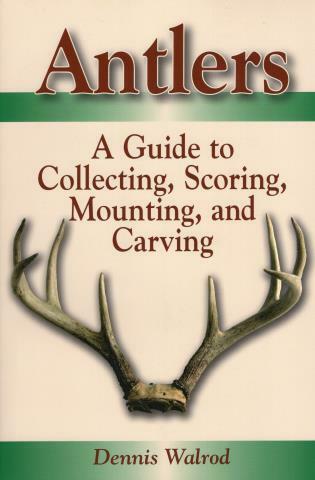 The book is also loaded with practical information and step-by-step instructions for collectors and craftsmen, designed to maximize the use (and profit) you can get out of your antlers. Dennis Walrod has written for a number of outdoor magazines, including Field and Stream, Outdoor Life, and Gray's Sporting Journal. He lives in western New York State. To find out more about Dennis Walrod and his books, check out his Website at: www.denniswalrod.com.